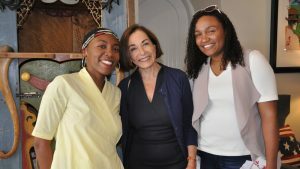 2017 Gould Fellows, Bertina Telusma (left) and Bruna Lima (right) pose with Sara Moss, Mike Gould’s wife. 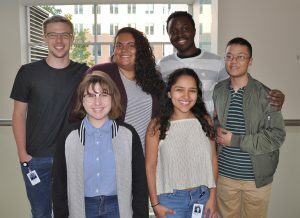 The Bernard S. and Sophie G. Gould Fund was established in 2016 to support students participating MIT’s Summer Research Program in Biology (MSRP­-Bio). MSRP-Bio was established in 2003 to provide an intensive research experience for undergraduate students from institutions with limited research opportunities — increasing the number of under­represented minority students, first generation college students, and students from economically disadvantaged backgrounds entering PhD or MD/PhD programs. To date, more than 250 students have participated in MSRP­-Bio, and over 80% of them have since enrolled in PhD or MD/PhD programs across the country, including more than three dozen who have studied at MIT in various departments.